and the signal appears on the whole width of the display namely over the 2 sec duration for a 200msec/div selection. What can explain such a huge difference? Whenever used with other devices such as auxiliary disks, the USB data transfer rate is of 6 MegaBytes/sec or much much much more. 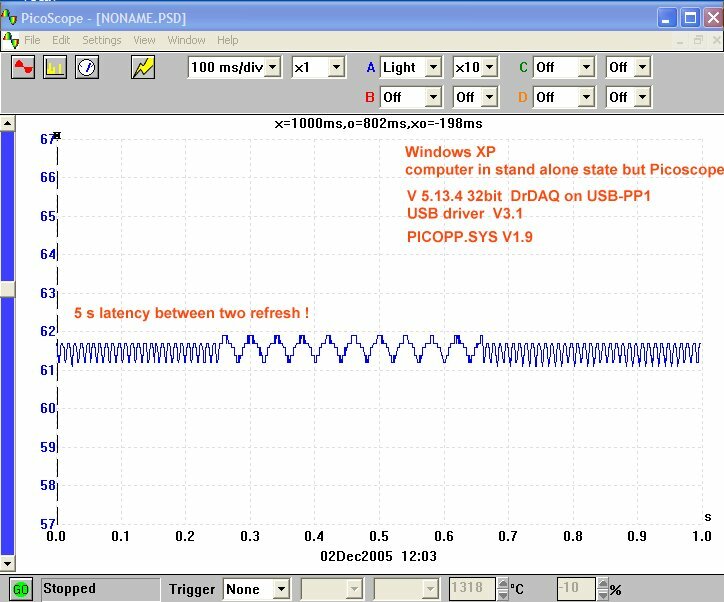 Therefore, PicoScope is not taking advantage of the available transfer data rate on the USB interface. Maybe Picoscope sees my USB2 interface as a slow RS232 fax machine? any idea to get this USB converter usable ? the USB ports of those computers when interfaced to other devices stand more than 6Mbytes/s. Only PICOSCOPE triggers the fan of the computer to ON to only display very few values every several seconds. I will need to get our engingeers to look at this and get back to you. whatever the time scale base (msec/div) is, while no other USB devices are connected. data rate acquisition is 10 times faster on the parallel port than via the USB port. The latter test is carried out such that only one interface type is connected at a time. data rate on any of my laptop PC's. Thank you for your help to eventually get the "USB parallel port" interface operational. Test on another desktop PC! Trace data are displayed by bursts every 5sec or more whatever the width of time window is selected. PICOSCOPE is the only application running and consumes 100% cpu. with no terrific idle time between 2 acquisitions? Trace data are displayed by bursts every 5sec or more whatever the selected width of time window is. Actually, V5.20 (year2008) behaves the same since V5.14 (year 2006). 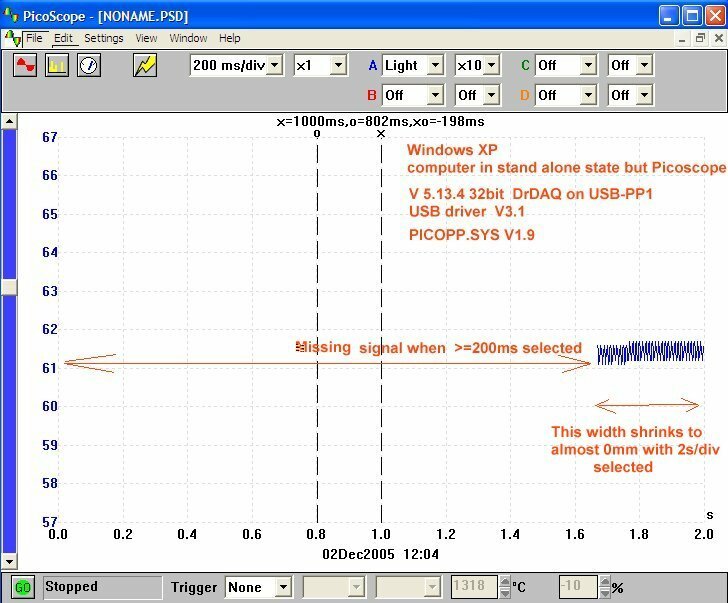 Namely, DrDAQ on USB Parallel Port of Picotech is not usable from PicoScope on my winXP computers (USB 2.0). Above 50ms/div, data acq and display stops before it gets to the end of the time window. The scope screen is refreshed at about once every 10 or 15 odd seconds. The XP task manager shows PSW32.EXE using only 50% of the 1.66GHz CPU time while the other 50% are squandered by "System Idle Process" of XP. In addition, about 500MB of ram are free out of the total 1GB installed. If a remedy procedure exists to use PicoScope on USB Parallel Port as a scope, please let me know where I can read the steps to follow. I am afraid that the DrDaq and USB converter combination has never been a good one. There is little that can be done. The design of the DrDaq is now quite old and not suitable for efficient operation unde the latest operating systems and via USB. Sorry! Our latest USB scopes, including the new 2203, 4 & 5 are much faster. The DrDaq was always not much more than an educational tool. Actually, the DrDAQ module itself on a parallel port was quite satisfactory. Next, the USB to parallel port interface (hardware+software) was put for sale while this interface was not fully commissioned. I would then put the source of malfunction onto the latter. Seemingly from your above statement, this interface will remain in the present state. Shame on me, I will have to discard the 3 items I bought !! !